NEW YORK—When work is play and play is work, there’s no reason to stop working. 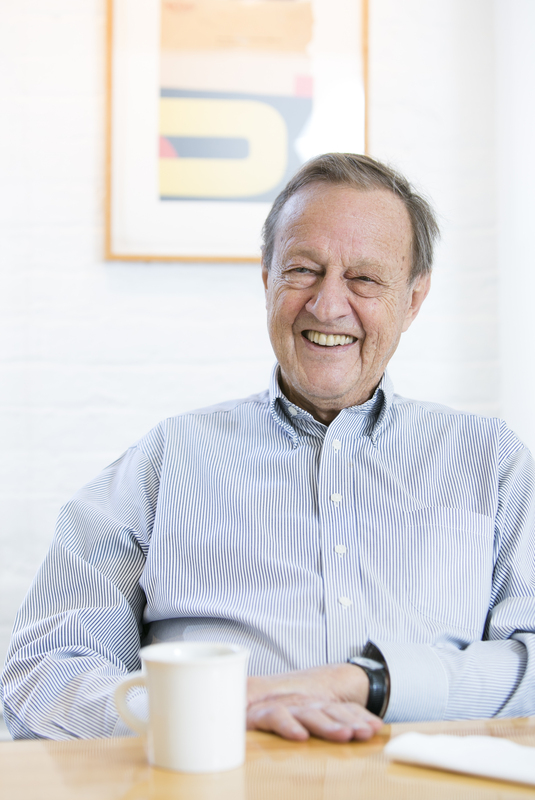 “There’s no possibility of even thinking of a better job,” said Ivan Chermayeff—a man who has influenced visual culture across the world in ways we take for granted every single day. The 82-year-old Chermayeff has designed hundreds of unforgettable images, including logos for PanAm, MoMA, Showtime, Harper Collins, Shinsegae, the U.S. Bicentennial, and the number 9 sculpture on West 57th Street. He has also designed numerous exhibits and has created posters for almost every museum in New York City. The firm he co-founded, Chermayeff & Geismar, has created many of the world’s most iconic brands—instantly recognizable—including: NBC, PBS, Chase, Mobil, National Geographic, and hundreds more. It’s difficult to walk down a few city blocks without seeing a logo the firm has designed. During his half-hour of downtime—when Chermayeff is not talking with clients or doing other scheduled tasks—he loves cutting and pasting disparate images to make collages. “Collages are just new connections of visual things,” Chermayeff said. But while growing up, life for Chermayeff may not have felt so connected. His father Sergei Chermayeff was a refugee from the Caucasus who had learned from experiencing the Bolshevik Revolution that it would be best for the family to leave England in 1940 before the Germans invaded. The family arrived first in Canada, and six months later in the United States, at the tail end of the Great Depression. Chermayeff was 8 years old and his younger brother Peter was 5. Whenever he visits England, he can easily slip back into a British accent. His father was fluent in five languages and survived by being a very good talker. He traveled around the country wherever opportunities presented themselves to lecture and teach as a visiting lecturer and critic of architecture. As a result Chermayeff went to 24 different schools in Chicago, San Francisco, New Orleans, Pennsylvania, and several other places he can’t remember. Sometimes he was in a school for only two weeks. As a child he had no other choice but to adapt to rapid changes—a constant stream of new faces and places. Eventually his father became established as a professor of architecture in New York, as the president of the Institute of Design in Chicago, and then as a professor at Harvard and Yale—the same institutions where Chermayeff studied, and in the same order. Almost everything that we’ve done lasts a lifetime, at least. Bender had not heard of graphic design as a discipline. It was a budding field at the time, but he granted Chermayeff’s unusual request. “It broke all the rules,” Chermayeff said chuckling. After studying at Harvard and at the Institute of Design in Chicago, he went to Yale on scholarship. The Graphic design department was new, without permanent faculty, so there was a constant stream of new people teaching. The best photographers and designers visited from New York, like his main mentor, only 10 years his elder, the leading American graphic artist Paul Rand, who is best known for his corporate logo designs such as IBM, UPS, and ABC. The Museum of the City of New York is currently showing Rand’s work—”Everything is Design. Everything!“—until July 19. It was at Yale where Chermayeff also met his longtime design and business partner of 58 years and counting, Tom Geismar. They founded the firm Chermayeff & Geismar in 1958. In a presentation Geismar gave at the School of Visual Arts in January, available on YouTube, he summed up the longevity of his partnership with Chermayeff in one word: trust. He attributed it to their mutual respect in each other’s judgment and taste, to their very different personalities meshing well, and to their shared priorities, which have evolved over time. In 2006 they brought in a third younger partner, Sagi Haviv, and in 2013 updated the name of the firm to Chermayeff & Geismar & Haviv. The design process is very collaborative. The partners work very efficiently by talking with each other, and giving suggestions and direction during the entire design process. While growing up and being exposed to a variety of lifestyles, norms, and perceptions may have been challenging for Chermayeff, it also forged in him a keen sensitivity to differences—an ability that would prove highly useful later in his life, especially with his clients. “There are very complicated things you have to find out: what is it, who’s it for, what’s it doing, why, who’s the competition, where’s the future, where’s the past, what do they think is good, what do they think is bad,” he said. “And then, believe me, they are not always right,” he added. Chermayeff described graphic design as a constant problem-solving process, not only with design partners, but also with the clients. Designing is solving other people’s problems, he said. “And you can’t do that without talking to them, and that means all of them,” he said emphasizing the “all.” So there’s a great deal of research that goes on before they even start sketching a logo. The process can last months. It takes time, tons of communicating, and acute perception to help form the identity of a company. If it is not thought through well enough, it can cost a company an enormous amount of money to change it later. Everybody is really different, that’s what makes it fun. Chermayeff and his partners consult their clients, as well as with the clients of their clients. “Graphic designers know what to throw in the garbage and know how to get down to something that is solid and real and simple—something that can be understood by ordinary people,” Chermayeff said. After finding out the main issues to solve, sketching and exploring designs, they always present about three to five options to the client and make a case for each one. “You have to make absolutely sure that it’s logical … The client wants to be sure that you believe it also,” Chermayeff said, emphasizing the integrity of the firm’s work. Another reason why Chermayeff loves his work so much is the constant learning. Each client he works with presents a whole array of idiosyncratic needs and problems to solve in terms of forming a company identity and logo. “Everybody is really different, that’s what makes it fun … I don’t have to pay tuition. I’m getting paid instead, and I learn more,” he said with a big smile. He would easily describe himself as an eternal student. The wisdom he extracted from his life’s journey so far reflects his understanding of what makes a good brand. “It has to be completely flexible and without losing itself,” he said. The Chermayeff & Geismar firm has created over 600 logos so far. The most famous is probably the logo for Mobil Oil. Even after Exxon bought the company, the Mobil logo remained in over 50,000 gas stations in the United States, and another 50,000 in the rest of the world. Graphic designers know what to throw in the garbage and know how to get down to something that is solid and real and simple. Chermayeff convinced Pan American World Airways to shorten their logo to simply PanAm. Each letter of a sign for a ticket office could cost up to about $50 depending on the material it’s made of. “It may have cost them tens of millions of dollars [to change it] but it saved them hundreds of millions of dollars” in the long run, he said. While Chermayeff may be flexible, perceptive, and open to suggestions, he is also very clear about his own vision. “I don’t listen to everybody about what I know more about than they do,” he said with a glint in his eye. 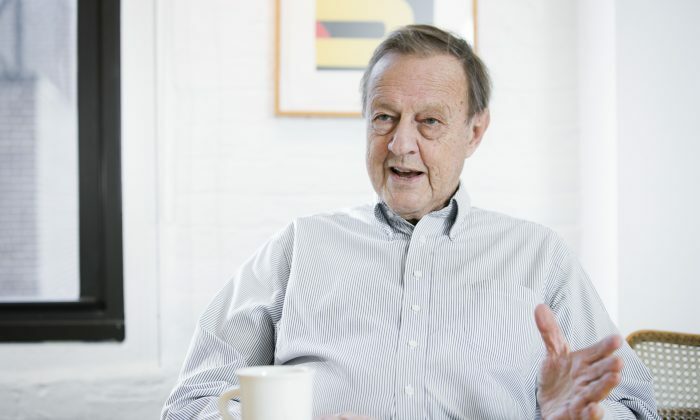 Chermayeff taught graphic design at Parsons School of Design and has been teaching for over 40 years at the School of Visual Arts (SVA), one of the first and “the best design school,” in the country he said. For the past two years the SVA has been pre-selecting it best honor students for a Chermayeff & Geismar & Haviv design class. The 12 students meet every Monday at the firm to learn all aspects of branding design and how to work with clients. Chermayeff said he teaches his students to be clear about what they are doing for people and how to communicate better. “We try to get them to sometimes slow down and think,” he said. Stacks of colored paper, sketchbooks, pens and pencils, and many books in different languages inhabit Chermayeff modestly sized office on the floor of his firm in the Flatiron District of Manhattan. There’s not one electronic device in sight. It looks like a little sanctuary for creativity in the middle of the big city. “I can’t allow anyone to move my things around because then I wouldn’t be able to find anything. I know where the bits of garbage are,” he said laughing. One of the reasons he doesn’t like buttons is because the young people he works with who’ve grown up with buttons are really fast, and “I wouldn’t want to be the most incompetent person in my own office,” he said. But they can’t keep up with him when it comes to drawing, “no way,” he said smiling. So he guides and directs. High-end retailers’ Chinese New Year promotions are attracting Chinese consumers with impressive purchasing power, but retailers are not getting it quite right. There are some things that money can buy and some things that it can't, and then there's the thrill of being able to deliver both.